A key U.S. lawmaker says he will try to force President Donald Trump's former national security adviser to repay "tens of thousands of dollars" to Russian and Turkish interests he represented in recent years even as he came to play a prominent role in Trump's election campaign. Michael Flynn, a retired U.S. Army general, held the top White House security post for just 24 days before Trump ousted him in February after Flynn lied to Vice President Mike Pence and others about his contacts with the Russian ambassador to Washington in the weeks before Trump assumed power. But the extent of payments by the Russian and Turkish interests to Flynn is only now coming to light with his new financial disclosure filings and information compiled by congressional investigators. In all, the documents show that Flynn accepted $500,000 last year to represent Turkish government interests in a dispute with the U.S. government and about $70,000 in fees and expenses from Russian-related organizations. The Russian payments included a 2015 trip to Moscow to celebrate the 10th anniversary of the Russian-funded RT television network at which he sat near Russian President Vladimir Putin at a gala dinner. 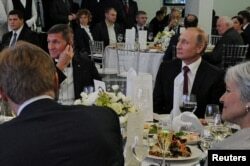 FILE - Russian President Vladimir Putin (R) sits next to retired U.S. Army Lieutenant General Michael Flynn (L) as they attend an exhibition marking the 10th anniversary of RT (Russia Today) television news channel in Moscow, Russia, Dec.10, 2015. Congressman Jason Chaffetz, the top Republican on the House of Representatives government oversight committee, said Monday he will ask the Government Accountability Office to examine the payments to Flynn. "Then the penalty most likely based on precedent would be that he'd have to repay all of the money that he did take," Chaffetz said. Flynn is at the center of ongoing investigations by the Federal Bureau of Investigation, the country's top criminal investigative agency, and the intelligence committees in both the House and Senate into the U.S. intelligence community's conclusion that Russia meddled in the election in an effort to help Trump win. The FBI says it is investigating whether Trump aides criminally colluded with Russian agents to boost his election chances. Last week, Flynn sought immunity from prosecution in exchange for his congressional testimony about his dealings with Russian interests. But he was rebuffed, with lawmakers saying it was too early in their investigation of the Russian interference in the election to determine whether they need to grant immunity to any witness.